Renowned behavioral economist and 2013 Nobel Laureate in Economic Sciences Robert J. Shiller will deliver the inaugural Paul Volcker Lecture in Behavioral Economics on Thursday, March 19, at 4 p.m. in Maxwell Auditorium. The lecture, “Speculative Prices, Inflation, and Behavioral Economics,” is sponsored by the Maxwell School of Citizenship and Public Affairs and the Center for Policy Research. The event is free and open to the public and will also be available via livestream. 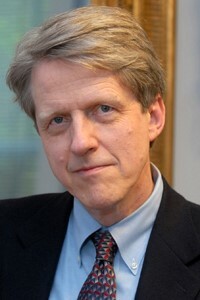 Shiller is Sterling Professor of Economics at Yale University and author of a number of books, including the best-selling “Irrational Exuberance,” Third Edition, an analysis and explication of speculative bubbles, particularly in real estate and the stock market. Known for his prescient forecasts of market behavior, including the dotcom bubble, Shiller’s research looks at how human psychology drives the economy. He writes on financial markets; financial innovation; behavioral economics; and on public attitudes, opinions and moral judgments regarding markets. Shiller is also the co-developer with Karl E. Case of the repeat-sales home price indices now published as the S&P/Case-Shiller Home Price Indices. He is a regular contributor to The New York Times’ Economic View column and to Project Syndicate, and he is a frequent expert commentator in the broadcast media on economic and business issues. Beginning in 2016, he will serve as president of the American Economic Association. The Volcker Lecture is presented by the Paul Volcker Chair in Behavioral Economics, which is held by Leonard E. Burman, professor of public administration and international affairs at the Maxwell School and director of the Urban-Brookings Tax Policy Center in Washington, D.C. The chair was endowed by Robert Menschel, senior director at Goldman Sachs Group and trustee emeritus of Syracuse University, in honor of Paul Volcker whose career includes eight years as chairman of the board of governors under Presidents Carter and Reagan. Free parking for this event will be available in Irving Garage on Stadium Place.